Paddy McLaughlin set to be unveiled as the new Cliftonville manager this evening. PADDY McLaughlin will be unveiled as the new Cliftonville manager this evening. Institute confirmed this morning (Monday) that McLaughlin has resigned from his managerial post along with his backroom team who are expected to join him at Solitude. McLaughlin has beaten off strong contenders for the Cliftonville position including former Derry City boss Kenny Shiels and ex-Linfield manager Warren Feeney who were understood to have been interviewed for the post at the weekend. Former Derry City defender McLaughlin (39) has been in charge of Institute for the past 18 months and guided them back into the Dankse Bank Premiership this season. As revealed in last week's 'Journal' the Creggan man was the club's No.1 target and had made an official approach to Institute last week. And in a statement this morning the club confirmed McLaughlin had parted company, wishing him all the best in the future. It read: "Institute FC can confirm that Paddy McLaughlin, Brian Donaghy and Conleth McCrudden have all resigned from their positions with the club. "The club would like to thank Paddy for his dedication, hard work and achievements as a 'Stute player and manager. "We wish him, Brian and Conleth well in the challenges that lie ahead for them. "The club will be consulting with our players over the next few days to reach a consensus on the best way forward." Former Reds boss, Barry Gray was dismissed just minutes after a 3-1 defeat to Dungannon Swifts on January 19 left the team languishing in sixth place in the Danske Bank Premiership. 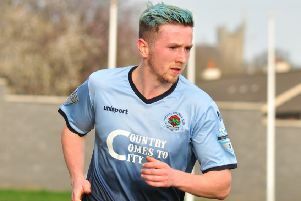 McLaughlin is expected to take his first training session with the north Belfast club tomorrow with his first game at home to Newry City on Saturday. Cliftonville's season now rests on securing European qualification through the play-offs having already exited the Irish Cup.